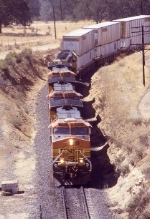 Description: JEPX train heading southbound toward Reno Junction. Description: The track in the background is UP's Palmdale Cutoff. Description: BNSF's MLUBLAL(Manifest Lubbock, TX-Lafayette, La) waits at GCL Jct. on KCS's West Main Track. Title: BNSF with the "Plane Train"
Description: BNSF Seattle, WA (Stacy Yard) to Pasco, WA manifest train M-SEAPAS1-21A departs Argo on the BNSF Seattle Subdivision - BNSF C44-9W 4989, BNSF C44-9W 5366, BNSF C44-9W 5662, BNSF GP39E 2910, BNSF GP38-2 2092, 19 loads, 41 empties, 3898 tons, 4054 feet with power, ETD BNQ 43237.